Camille Estephan, the manager for WBC heavyweight champion Bermane Stiverne (24-1-1, 21 KOs), sees #1 WBC challenger Deontay Wilder (32-0, 32 KOs) as a fighter who has been carefully managed to get him to the point where he’s unbeaten and challenging for the title this Saturday night on January 17th at the MGM Grand in Las Vegas, Nevada. There’s no denying that the 6’7” Deontay has a record that is filled with weaker opponents. He’s not really faced a solid B level opponent as of yet unless you count Malik Scott, a fighter who crumbled after getting hit with a glancing blow in the 1st round of their fight last year in April. Wilder be facing his first real test of his career against Stiverne and a lot of boxing fans want to see whether he’ll be able to take the hard shots that Stiverne periodically hits him with in this fight. Wilder has the size and reach to make sure he doesn’t get hit a lot in this fight. He doesn’t stand close and position himself directly in front of his opponents the way that Stiverne’s last opponent Chris Arreola did. Wilder tends to stay on the outside until he sees an opening, and he then launches himself across the ring with a hard right hand. 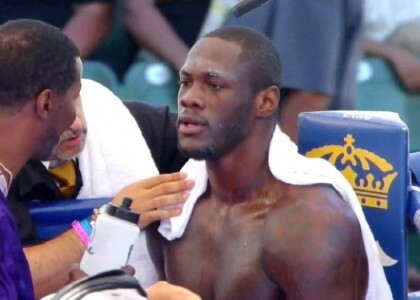 Depending on if his opponent is shaken after the blow, Wilder will either flurry or back up and reset himself for another big right hand. The only real way that Stiverne will be able to hit Wilder with any consistency is if he can time him while he’s coming in or nail him when he’s pulling back with a left hook. Both are possibilities for Stiverne. If Wilder can’t take Stiverne’s sneaky left hooks, then this fight could end very quickly. But that goes two ways. Stiverne is going to need to prove that he can take Wilder’s right hands, which are very powerful and they tend to land to the back of his opponents’ heads when he loops them like he did in his fights against Sergei Liakhovich and Audley Harrison. Getting hit with shots like that is pretty brutal, no matter how good of a chin Stiverne has. Wilder doesn’t have the experience that Stiverne has, but you can tell from watching him fight that his power is very real and very devastating.